The Granite State has a radically simple fiscal idea. Manchester, N.H. — Newt Gingrich’s fourth-place finish in the New Hampshire primary showcased a first-rate idea. While addressing a hotel ballroom full of his forlorn supporters in the Radisson’s Center of New Hampshire here, the former House speaker praised a new Granite State budget procedure that is so commonsensical, it is startling that it deserves applause. Like a new automobile model whose designers boast that it features brakes, this legislative reform is so logical, one wonders why it had to be installed in the first place. Apparently, Republican legislators applied the brakes just in time. The Union Leader’s endorsement, however, was not enough to propel Gingrich past Jon Huntsman, Ron Paul, or Mitt Romney, all of whom beat him in the Granite State primary. Amid activists waving signs that read “Mitt Zombie — No Soul Politician” and “A.B.R. : Anybody but Romney,” a very lively band played 1970s hits, including a Taste of Honey’s “Boogie No More.” (It’s funny how a song that would have elicited cries of “Death to disco!” 34 years ago now is safe enough for an election-night party.) Alas for Gingrich, neither the placards nor the tunes concealed the fact that fourth place is light years from even a bronze medal. Nonetheless, Newt Gingrich buoyantly promised his troops: “I will do everything I can to win the opportunity to represent you this fall in debating and then defeating Barack Obama!” With that, the crowd of some 250 cheered and then bolted immediately for the exits. Within two minutes, the room was virtually depopulated, as if the Newtonians had been extracted with a vacuum cleaner. 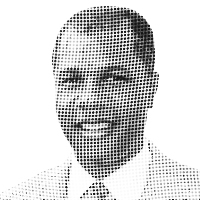 — New York commentator Deroy Murdock is a nationally syndicated columnist with the Scripps Howard News Service and a media fellow with Stanford University’s Hoover Institution.